I’ve never been a big one for pork. Although it’s undeniably delicious, there’s just something about it that doesn’t scream I AM HEALTH FOOD! Blame it on hot dogs, bacon, sausage, SCRAPPLE. In reality though this ‘other white meat’ is indeed a lean and very low sodium alternative and when I spied this recipe in Food Network Kitchens Favorite Recipes the other day, all I could think was YUM!! And so here we are. Staring down the barrel of one of the most delicious low sodium oinkers ever. If you want to just reach up and sink your teeth into that pork chop above, I don’t blame you. But as delectable as they look, they taste even better. 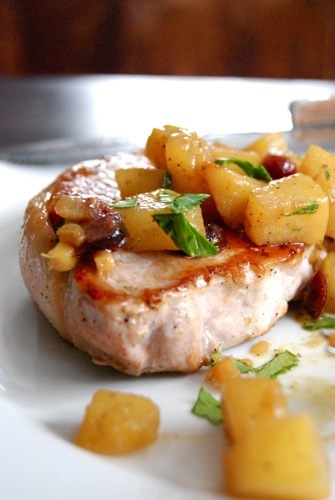 Imagine juicy, meaty, pork-tastic chops, dripping with pan flavor, smothered with the bite of sweet pear and chewy cranberries, scented with ginger and curry and OOOooooooohh!! What are you still reading this for??! 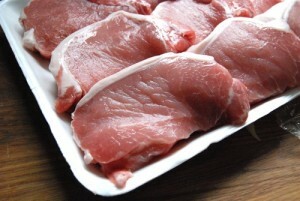 Get get some pork chops — NOW!! 8 thin center loin pork chops, each 4 oz. First assemble the chutney. 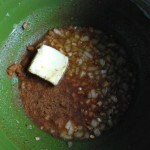 Measure the onion, vinegar, brown sugar, butter, ginger, curry powder, cinnamon and red pepper flakes into a medium sized MICROWAVE SAFE bowl. Stir well to combine, then cover bowl with microwave proof plastic wrap. Place in microwave and set to high for one minute. 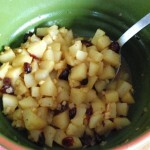 Remove from microwave, carefully peel back the wrap and add the diced pear and cranberries. Stir well, then recover with wrap. Place in microwave and set to high for 10 minutes more. Remove from microwave and puncture wrap to allow steam to vent. Set aside. Next cook the pork chops. Heat 1 T. vegetable oil in a large frying or saute pan over medium-high heat. 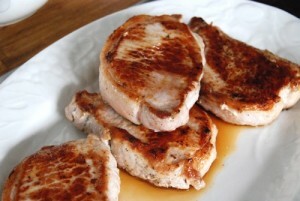 Season the pork chops with freshly ground black pepper to taste. 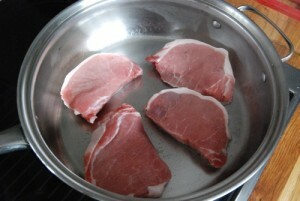 Once oil is sizzling, add four of the chops to the pan. 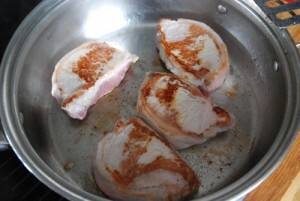 Cook 4 minutes, then flip and cook another 4 minutes – slightly less for thinner chops or slightly longer for thicker. Do not over cook as pork toughens (like boots!) very quickly. 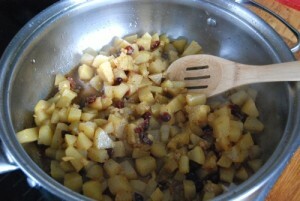 Remove from pan and set aside on a serving plate (someplace warm, preferably). Add the second tablespoon of oil to the pan and repeat process with the remaining four chops. 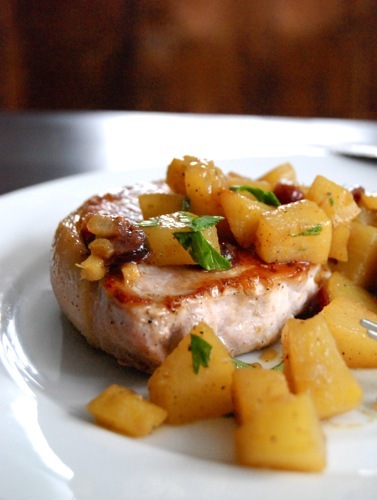 Once all of the pork chops are cooked, add the chutney to the pan, and using a wooden spoon, scrape up any pan drippings and simmer, stirring, until thickened slightly. Remove from heat, stir in the cilantro, and then serve immediately, plating 2 chops each with a generous helping of chutney. ENJOY! 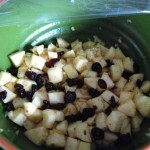 This entry was posted in Main Dishes and tagged Food Network Kitchen Favorite Recipes. Bookmark the permalink. Pork is my favourite! Of course, I was raised on a pig farm where the slogan “the other white meat” was literally hanging on a fencerow outside our house, so I guess I grew up thinking it was healthy. The sear on those chops looks amaaaaaaaazing. I have to admit I wasn’t really sure what chutney was before I read this… I’d be embarrassed if I had any food pride left! Seriously though, Christy – you do such an amazing job with this blog… you present such amazing looking stuff in a way that makes me think even I could cook… something. Some day. Maybe. I sure hope you win! Inky — you crack me up! And THANK YOU!! Truly. You just gave me the greatest compliment ever. It’s one thing to run a food blog for fun, or to wow people with HEY LOOK WHAT I CAN DO!! But the best thing anyone could say to me is that I’ve inspired them to cook.